I promise I have not abandoned you, my lovely little creative space! But I have been super busy crafting, creating, volunteering, and teaching my two wee ones. This Monday night at Girl Scouts we began our sewing project. Although there is, shockingly, not a badge for that, it is something Abby has been begging me to learn and several other girls have expressed interest in as well. We are creating sit-upons for use this summer when we go camping. 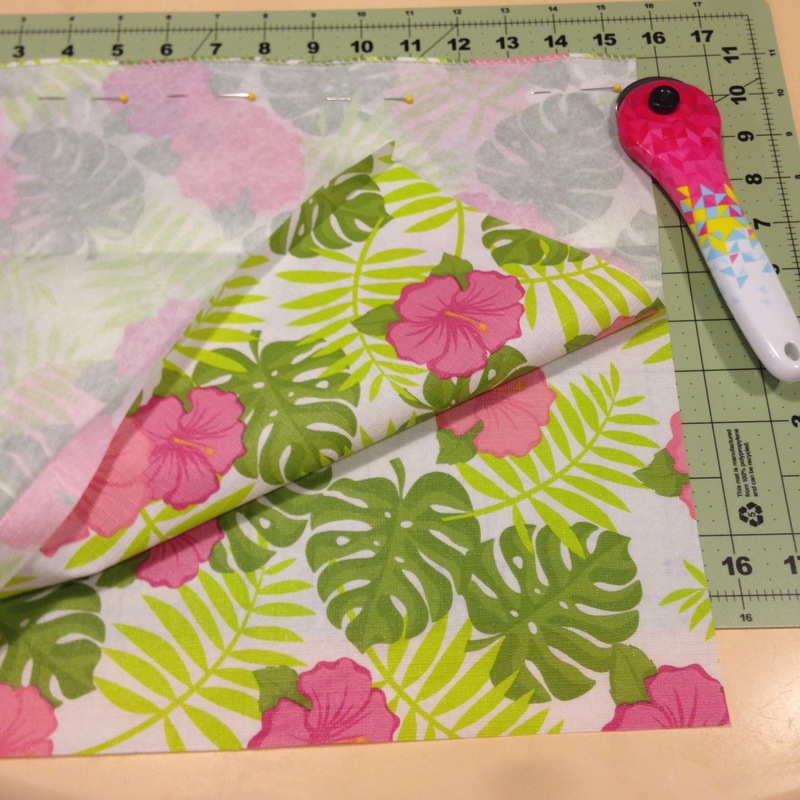 Pinterest is brimming with ideas, patterns and how-tos for all sorts of sit-upons, and ours is a very common concept frequently used which utilizes plastic bags as stuffing and flannel backed vinyl tablecloth as the outside fabric. This is the example I made shortly before our meeting. 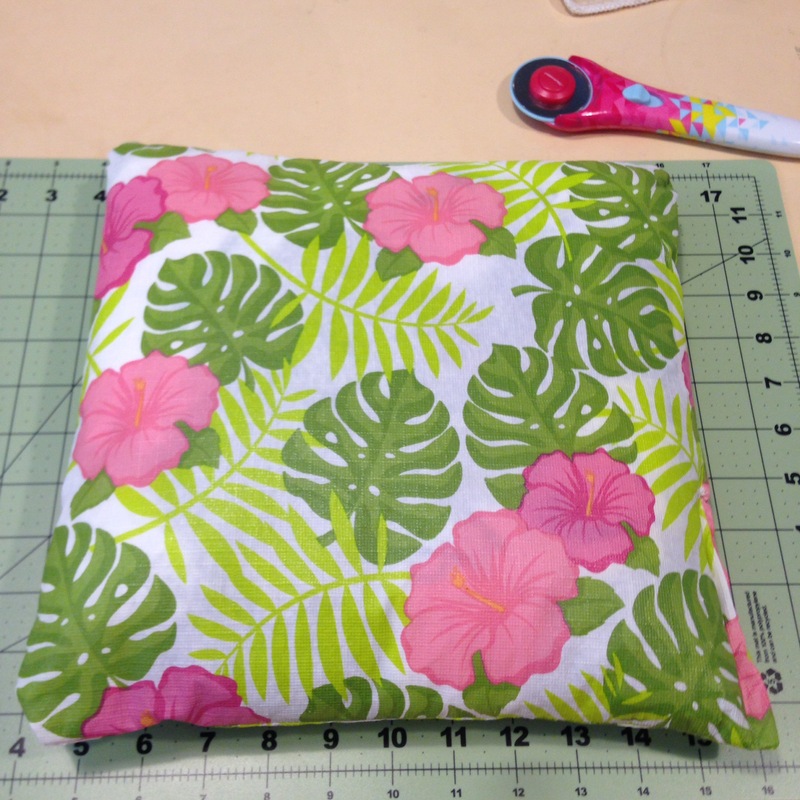 Just two squares sewn together with plastic bagging stuffing. 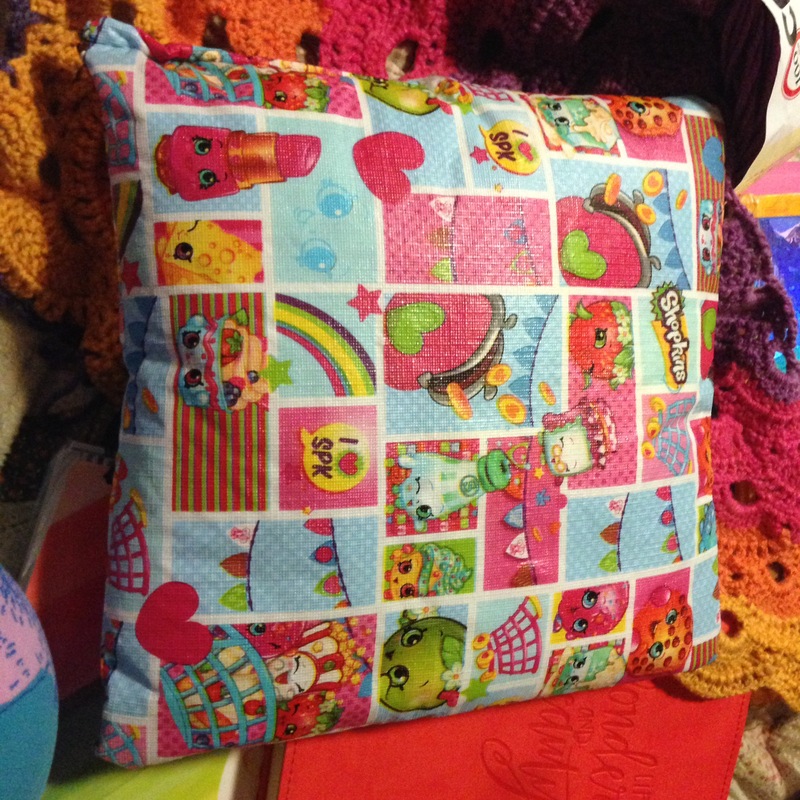 Of course, if your daughter is like mine and obsessed with Shopkins you can buy the same fabric at your local Jo Anns Craft store in an assortment of licensed characters. Plus it is a tad bit more substantial than the vinyl tablecloth you would buy at the store. (P.S. YES that IS a virus shawl you see behind that sit-upon! Shhh…. more on that and other projects later). Of course, no Girl Scout meeting would be complete without a Plan B activity. You know, the one that the girls work on quietly while the adults try to repair or clean up whatever disaster befalls us. I jest… kind of. 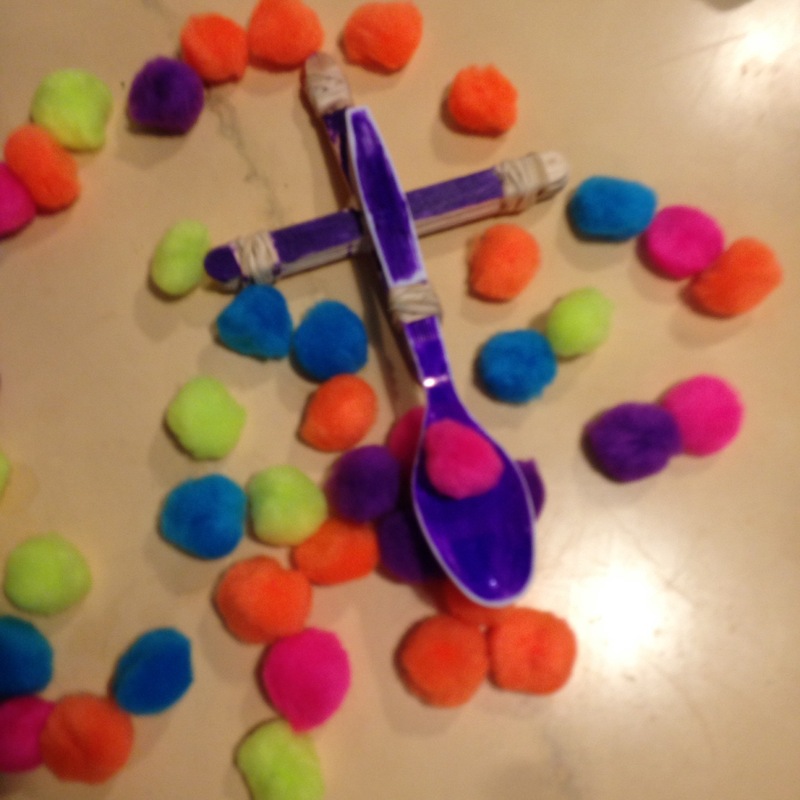 Behold, the magic of the pom-pom catapult! We made these at VBS, and the one you see pictured here is actually my youngest daughters shooter. This was a huge hit with the girls. I think about half of them liked this activity more than the sewing! Can we take moment to talk about how much fun these girls had crafty and creating something with their hands? Oh, how I long for the traditional days of Girl Scouts! I really dislike these curriculum inspired badges and “feelings” activities. Its not that I don’t think these things are important, its just that I think more gets accomplished if you flesh out “feelings” while you are actually doing something. Ya know, like sewing and shooting pom-poms at each other. THAT’s memories folks, and plenty of bonding time to make lasting relationships with other gal pals. Speaking of traditional Girl Scouts, can you guess what I’ve spent the past few months doing? Yup! COOKIES! And cookies is big business in Girl Scouts! This is what I have left after everyone picked up their orders. That’s right, this does not include all the dozens and dozens of boxes already delivered and sold. We make very little profit per box, but we sell so much that in the end it becomes our primary fundraiser. The rest of our year depends upon the profit we make during cookies season. 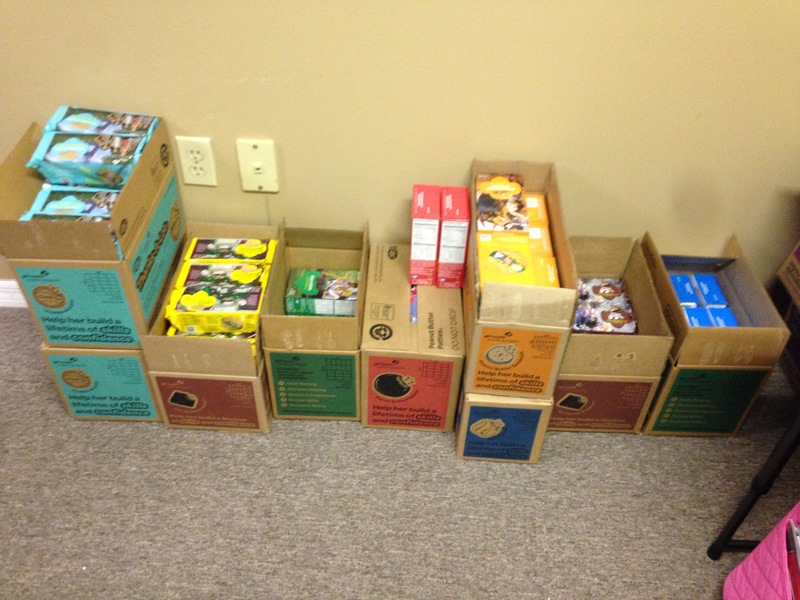 So, next time you see a Girl Scout, buy a box or two y’all (or three)! And this year my handsome hubster allowed me to keep our boxes at his law firm. My house is so tiny that last year it was nearly impossible to move around the tower of boxes we had stacked in a little corner of our living room. But not this year! Huzzah! I will have a couple of crafty WIPS to share very soon with you! I have been busy, busy, busy with projects and shortly is our Volunteer Retreat weekend at Mah Kah Wee (one of the best places on Earth). Stayed tuned my crafty chick-a-dees! < Previous Which house do you belong to?